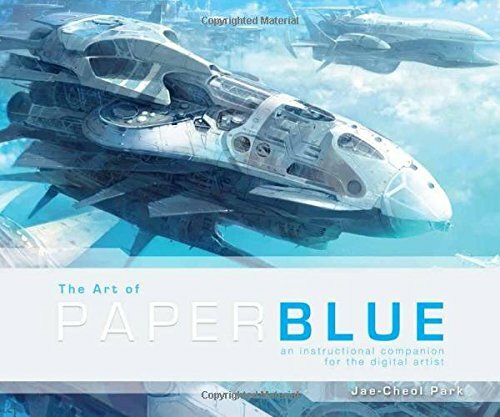 The Art of Paperblue is the instructional artbook from Korean concept artist Jae-Cheol Park who goes by the nickname Paperblue. He has been creating concept art for more than 10 years already. This is a large format 192-page paperback that features predominantly tutorials on digital painting techniques and process, leaving just 40 pages of gallery. There are 10 step-by-step tutorials, 20 mini tutorials and 6 video demos (no audio) totalling over 130 minutes. Yup, it's quite a lengthy instructional book. Subject matter includes painting vehicles, ships, spacecrafts and landscapes scenes. The full tutorials start from the conceptualisation stage to the finished paintings. Paperblue talks not only about the techniques but also the rationale behind the process, stuff like colours, composition, perspective, texturing, custom brushes and the little details that matter. There are screenshots of the tools used and pointers into the paintings to explain certain things more clearly. Mini tutorials have fewer step by step screenshots and explanations, but are also quite insightful. You can sort of get the idea of his workflow that's based on the earlier full length tutorials. There are many pieces of artworks being featured in this section and even more in the gallery section that follows. Check out his website to see if you like his style. The pieces I like are those that start off as acrylic or oil paintings which are later scanned into to work upon. Those have really nice textures that give a feeling that's difficult to replicate with digital tools. It's a good book for digital artists. You'll definitely need basic digital painting skills to apply the knowledge but it's a book suitable for beginners to advanced levels. The instructions are easy to understand.